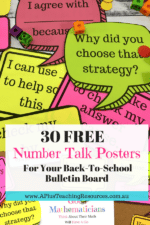 Are you looking for some back to school math activities? These math ideas are perfect for teachers in 2nd and 3rd grade classrooms. Read on for 3 math activities, 2 free printables, and tips for implementing these ideas during your first week(s) of school. Wondering how to get math started in your second or third grade classroom? Try one, or ALL of these back to school math ideas! 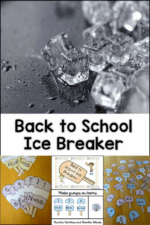 These 3 back to school math activities (and 2 free math printables) are classroom tested and approved for the first weeks of school in any second and third grade classroom. Math Activity #2 has proven quite successful in grades 1-5, so all elementary teachers can find some back to school math fun below. This real world math project asks students to help an architect determine how many steps will be needed to build a staircase. (Not to ruin the surprise, but it’s 55). *Is FREE and PRINT & GO so you have to do pretty much zero prep to have it ready. You can read more about this project and download the freebie at my blog HERE. Show students the book Chasing Vermeer (affiliate link) This engaging mystery by Blue Balliet has a pentomino by name chart inside and pentominoes on the cover. Then see if students can figure out how the pentominoes are named (spoiler alert: it’s by letters of the alphabet). Then let your kids try to make squares and rectangles using as many pieces as they can. Pentominoes are a super fast finisher that all students can use (and love), so not only do you have a fun first day math activity, you are also introducing a fast finisher students will have available to them all year. During these first weeks of school it’s pretty much priceless to have a “go to” fast finisher ready on Day 1! The ultimate goal with pentominoes is to use all 12 pieces to create a square or rectangle with no overlapping pieces or gaps. However, on the first day tell students that although a 12-piecer is the ultimate/most amazing/crazy sauce goal, right now they just want to try and use as many pieces as they can to create a square or rectangle. which sounds crazy, but it’s actually very cute. If you’re a recovering type-A like moi, you can also have them hold up fingers silently which still works and keeps it nice and calm. Although it would be lovely to have a different colored pentomino set for every student – it ain’t gonna happen. The buckets usually come in primary/secondary colors only. Before you give sets out to students, label EVERY PIECE within each set of pentominoes. You can have one blank set of each color, but then you need to get creative and make a yellow smiley face set, purple star set, red heart set (you get the idea). DO NOT just give out brand new pentominoes unless you want to organize 12 piece pentomino sets during your planning time for the next EVER. Learn from my foolish mistakes and Promise ME you will not do this! If you want to be brave you can have students label, but to me a 2nd grader with a Sharpie marker = Death, so I wouldn’t recommend. Typically when you buy a bucket of pentominoes they come with 72 pieces (don’t be fooled – 72 pieces only equals 6 complete sets per bucket), which means you need to buy 4-5 buckets for a whole class set. Don’t despair if you can’t purchase a whole class set and don’t you dare spend your whole paycheck on pentominoes. Students can share! These are another great addition to your fast finisher area! On the first weeks of school it’s important to show students what it looks like in your classroom to show mathematical work in an organized way and write about mathematical thinking. This is the goal of math challenges which consist of more difficult multi-step problems. Make sure you complete one or two of these as a class BEFORE putting them in the fast finisher area. It will save you lots of hassle later, plus you can use a few students’ completed challenges as models for others to reference later when completing these independently. You can download the free math September Math Challenge at my TpT store HERE. Want more free math resources? Hop on over to the original post at my blog and sign up to get some extra exclusive math challenges to start out the school year! This post was originally published at the I Want to be a Super Teacher blog. You can find it HERE. I help straight-talking teachers, with a flair for fun, engage every learner 2-3! I have fourteen years of classroom teaching experience in grades 2-3, and am passionate about helping teachers engage every learner & personalize instruction using projects, menus, and challenges. If you're all about implementing super (yet practical) teaching practices, and love those little details that make teaching so much fun, come visit me at I Want to be a Super Teacher! Want more freebies? Join the Super Teacher email list to get exclusive freebies, tips, and ideas for your 2nd or 3rd grade classroom delivered right to your inbox. Emails go out to my Super Teacher friends every Friday!